I did get to Scrapbook just a little bit yesterday. This was a challenge between Amanda and I. We share a Layout with each other once a month and the other has to scraplift it. This is our first month and I still haven't even gotten a new LO to her yet. Oh, well. I will soon, Manda - promise!! Here is mine - and I will give you hers as well to show how the LOs are alike. Unfortunately they aren't exactly alike since she had enlargements of her pics and also because my printed paper had words that I had to keep right side up so I didn't have the amount of leftover pieces. But they are still almost exactly alike. I enjoyed this, Manda! 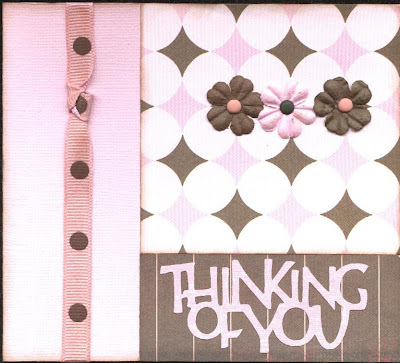 I also made a card for one of my friends in Indiana whose father passed away on Sunday night. Last night we went to church. Pastor Cravens had gone to the Philippines in January, so in our service last night he showed a bunch of pictures and let us know what all went on over there. It was interesting. We are glad he got to go. Today I have to finish up laundry. Don't have much left. Did most of it yesterday. Tonight is Women of Worth. They will have a chocolate fountain there. YUM! I shouldn't be eating it, but I am sure I will have a little. A very little! I called Pam a few times to see if she wanted to go - still haven't heard from her. I'm sure she is really busy. I think I will still go though. Lori can't go this time. Dawn - Missy doesn't have a blog. Sorry. We will see each other soon!! l8r, g8r! Missy - I really wish you could have been here, too. I waited for you all night. Hoping that you would be able to come. I understand though. There are more of these and there is only one time a year where you guys get together. It is fine. YOU BETTER BE HERE NEXT TIME THOUGH!! 8-) Luv ya! Leanna - Yes, you should start. Or you are at risk of getting terribly behind like me!!! haha No, I understand that it is a big deal to just make yourself start with it. And I k now it is frustrating to get it out and put it away every time. Maybe sometime you and Jonathan can come up on a weekend when I am having a crop. Is Jonathan any better? 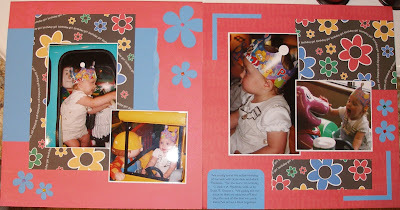 Your scrapbook looks great! And so did the card. I definetly think you should start selling some of your stuff. You do such a good job. We will try and discuss more on when we will try and come and see you in about a month. My Mom will be off work at least another month due to her shoulder surgery. 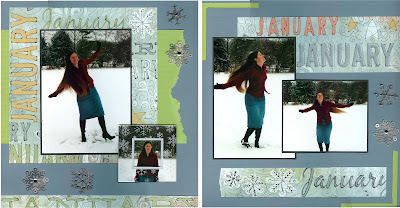 Your scrapbooking looks great. Jonathan was getting better... but he has worsened and goes back to the doctor in the morning. I just hope it hasn't gone into pneumonia. I will let you know or check my blog for an update. Later. Tell me to go clean!! !